You are here: Home / All Freebies / Autumn Riddles for Vocabulary and Comprehension! Do you use riddles in your teaching? They’re such an engaging teaching tool! Riddles provide great opportunities to introduce and practice new vocabulary, and to model so many important comprehension skills! Keep reading for some special info about free autumn riddles! No doubt about it, the little guys love riddles, and riddles actually do have a useful place in the curriculum. How can you use riddles to teach? Use Riddles for Vocabulary Instruction When you’re reading a riddle to your students, you’ve really got their full attention. They are thinking hard about the clues (well, at least when the littles catch on to what riddles are all about!). They’re building connections to their prior knowledge and adding new information to what they already know. All of this means that the new words you’re introducing via riddles have a much greater chance of “sticking”! Use Riddles for Teaching Comprehension Skills Modeling is key! In your early teaching with riddles, be sure to do lots of talking aloud about your thinking. When you make phrases like, “I already know…” and “The last clue told me…” part of your talk, your students will start to talk and think that way, too! As children learn to connect the information in the clues and discard choices that don’t fit across all the clues, they are determining key details. This foundational understanding will lead to making inferences and drawing conclusions. 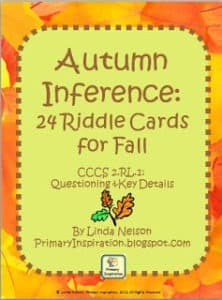 Here’s a set of 24 autumn riddles that will have your K-2 students determining key details, applying their prior knowledge, and inferring the answers. And, of course, they’ll also be adding to their understanding of autumn vocabulary! These autumn riddles are a form of informational text, since they feature autumn social studies and science topics, like apples, Johnny Appleseed, fire safety, leaves, Columbus, pumpkins, autumn months, bats, Halloween, and Thanksgiving. Use your riddle cards for whole class or small group lessons on key details and inference. 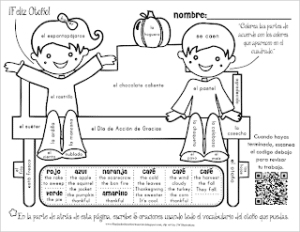 They’ll also make a good matching or pocket chart activity for a literacy center. There’s a four-in-a-row game board included, for more practice with the same vocabulary, and even a riddle writing activity in this set! Looking for more fall freebies? Try here and again here! Parts of this post were originally published on Primary Inspiration blog.